Do you have digital fabrication equipment such as a ShopBot CNC machine, laser cutter, and/or a 3D printer, and an interest in education? Do you want to know more about the software and machines available to you? Are you a facilitator of a digital FabLab or Makerspace who would like to join a support network of other educators to discuss project-based learning, lesson plans, and how to address standards? Then this hands-on workshop is for you! ShopBot’s Sallye Coyle will be facilitating a multi-day “Digital Fabrication in Education” workshop at ShopBot headquarters in Durham, NC. This 2½ day workshop will begin with ShopBot CNC machines. Using VCarve Pro CAD/CAM software, we will design and prepare files for machining on a ShopBot. 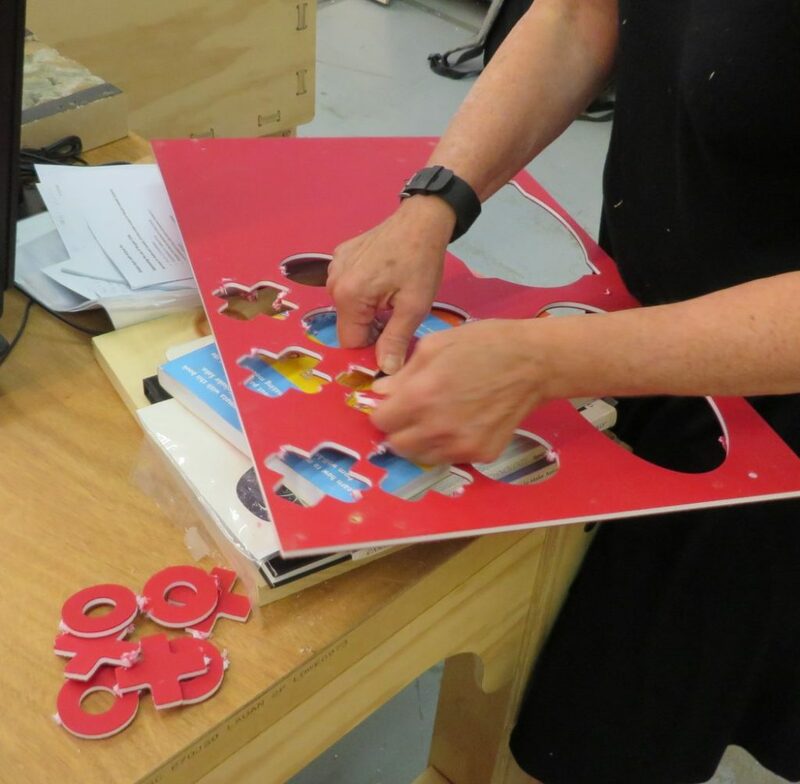 The sessions will then move to cross-platform training—demonstrating how designs originally intended for one digital fabrication tool can be prepared for use on another platform (example: CNC to laser or vinyl cutter, 3D printer to CNC machine). Topics will include design flow, 2D vs. 3D Computer Aided Design (CAD) and Machining (CAM) software, and how to evaluate which digital fabrication process is best for a desired outcome. 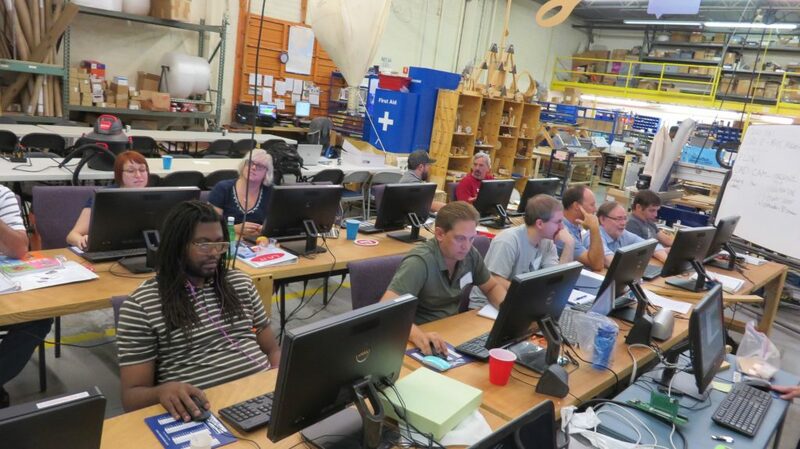 The final half day will return to ShopBot tools, providing more advanced information for those charged with installing, maintaining, or getting the most out of their CNC machine. Workshop student punches out custom tic-tac-toe pieces cut on a ShopBot. While you do not have to have CNC or CAD/CAM experience, familiarity with some aspect of digital fabrication would be helpful. There will be opportunities for show and tell, and at least one round table discussion, so you should come prepared with questions and/or examples of how to use digital fabrication in education. Working in collaboration with your fellow attendees, you should leave the workshop with hands-on projects and ideas to address topics related to STEM, CTE, the Arts, Common Core, and/or Next Generation Science Standards. May 18 – 20, June 8 – 10 and July 20 – 22. If you’re interested in attending the workshop, send us an email at info@shopbottools.com with your name, contact details, and a couple of sentences about your experience level. And of course, questions are welcome! For more info on the event, check out our roundup of last year’s workshop. To learn more about local accommodations and other things in Durham, see the visitors section of our website. Sallye Coyle is experiencing how rapid advances in computers, software, and technology have changed the way education is served by digital fabrication spaces. She has traveled extensively in the US and the world, working with schools, FabLabs, TechShops, and makerspaces to “train the trainers” in how to use the digital fabrication technology, as well as how to build, maintain, and use ShopBot tools. We are working on making a suite of other digital fabrication tools (and their handlers) available on-site for the workshop. These tools include: a vinyl cutter, laser cutter, and an Ultimaker 3D printer.